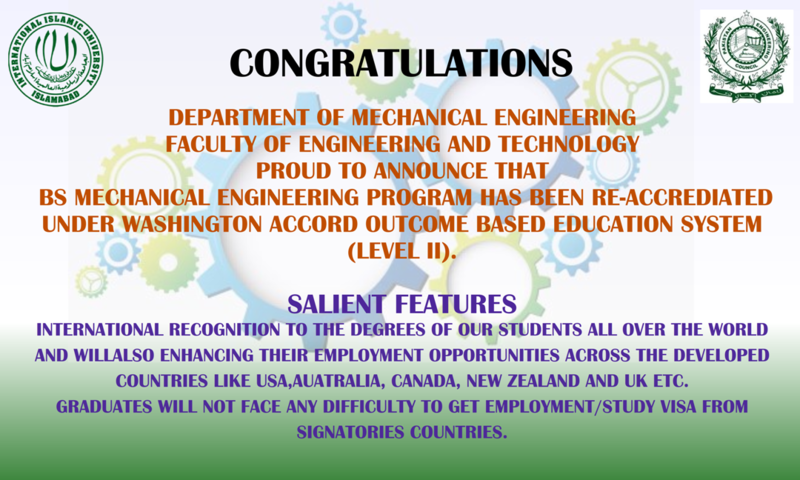 Department of mechanical engineering is committed to inculcate the students with pragmatic education, professional ethics, industrial academic linkage, R&D environment and leading tools to make the world a better place as per Islamic values. PEO1: Competent mechanical engineers perceiving in successful professional careers. PEO2: Serving industry and society through professional growth, R&D/entrepreneurship. PEO3: Effective mechanical engineers with leadership qualities having ethical Islamic values, interpersonal and managerial skills. The Department of Mechanical Engineering offers a 4-year BS degree in Mechanical Engineering along with MS and PhD in Mechanical Engineering and Engineering Management. The Department intends to provide a firm foundation in mathematics, physics and chemistry. The department offers students an excellent educational experience to sharpen their talents and skills through the contemporary and essential tools needed in the breadth and depth of mechanical engineering disciplines. The curriculum is designed to meet challenges forced by the industry and expectations of the modern corporate world as per guidelines of Outcome Based Education System (OBE). The department is in the process of implementing OBE to meet the demands and challenges of third post-IT revolution under the guidelines and umbrella of HEC & PEC. OBE has been successfully implemented and the department is about to seek accreditations concerning OBEs. The department provides excellent platform for young students to study and perform in challenging environment. The graduates would be well qualified to work in industry, research and development/multinational organizations or embark on their own engineering start-ups. Above all, the department provides conducive and intellectually stimulating environment for cognitive learning that would enable graduates to keep abreast of the technological advances in their chosen specialization. Internships and Industrial visits are arranged for students to provide an insight regarding internal working of companies. With an aim to go beyond academics, internships and industrial visit provides student a practical perspective on the world of work. It provides students with an opportunity to learn practically through interaction, working methods and employment practices. The infrastructure of the department is pivotal to its vision of multi-disciplinary education and research. It comprises state of the art and well equipped teaching and research laboratories, lecture halls and faculty offices.